At last summer’s Animal Rights 2012 conference in Washington, DC, I had the pleasure of meeting Matthew Glover, who had traveled from England to attend. Matthew is the kind of enthusiastic vegan who makes good things happen for everyone — an entrepreneur with the vision and means to take an idea and build it into something special. 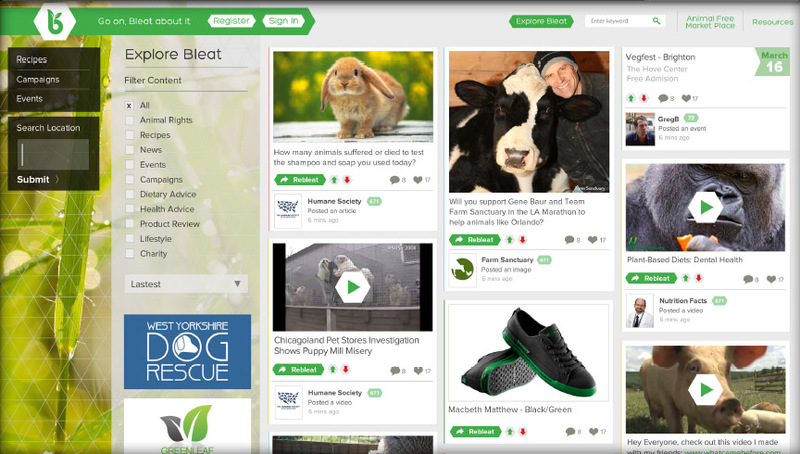 Matthew told me about a new online community he was working on called Bleat, which would combine resources like veggie restaurant guides and ethical shopping with a vegan/activist social network. “But it’s really much more than that,” he said. Matthew and his team have clearly been busy, and with Bleat now only weeks from its official May 1 launch, he provided a few more details about what looks to be a really exciting project. What’s the origin of Bleat? It all started when I clicked on a banner advert for “Meet Your Meat.” I had been a vegetarian for many years, but that video started me on a journey of research into animal rights and veganism. I read your book Striking at the Roots and The Animal Activist’s Handbook by Bruce Friedrich and Matt Ball as I was searching for my role in the movement. As I have been a businessman for 20 years, with a passion for marketing, other animal advocates suggested the best role for me would be continuing to use my expertise in these fields. So, I researched various vegan business ideas, and then an acquaintance suggested I should meet a fellow vegan who had an idea for a new vegan website. I was curious, so I met my partner in Bleat, Mike Dean, and within a few meetings we decided we had to create this website. Mike is the brains behind the website, so he is concentrating on managing the developers and turning his dream for a vegan social media website into a reality. Our main motivation for Bleat is to help the animals. Factory farming and other forms of animal exploitation need to stop, and we hope that our efforts can play a part in helping people to make the transition to veganism. So Mike is the creative force. How would you describe your role? I will be running the traditional business side of the business. I have two other business interests which from May will need only limited involvement from me. So from May 1st, Bleat will become my main job. I will be networking with animal advocates, vegan business owners, and others to help get the site launched successfully. To begin with we’re targeting vegans. But we hope the site will be a great tool for helping people who are currently vegetarian or omnivore to make the transition. Have you gotten much support from the vegan/animal rights community so far? Yes, we’ve been surprised by how much support we have received. It started when we created an online survey and posted the link on Facebook and Twitter. We had over 400 responses in a short amount of time, with relatively little promotion. Since then we have presented our ideas to many of the main animal rights organizations and they’re all keen to be involved and help promote the launch. We’ve created a Facebook group, which has hundreds of followers already, and we have a list of volunteers wanting to be involved in the beta testing stage. We’re confident that once the site goes live on May 1st, the support we get from a very passionate community will help get the site off the ground. What will Bleat offer that users can’t get on other websites? What we’re doing is creating a platform where users can bring all the information that already exists online into one place. Our site will have recipes, restaurant search, product search, events, animal rights news, health and dietary information all in one place. 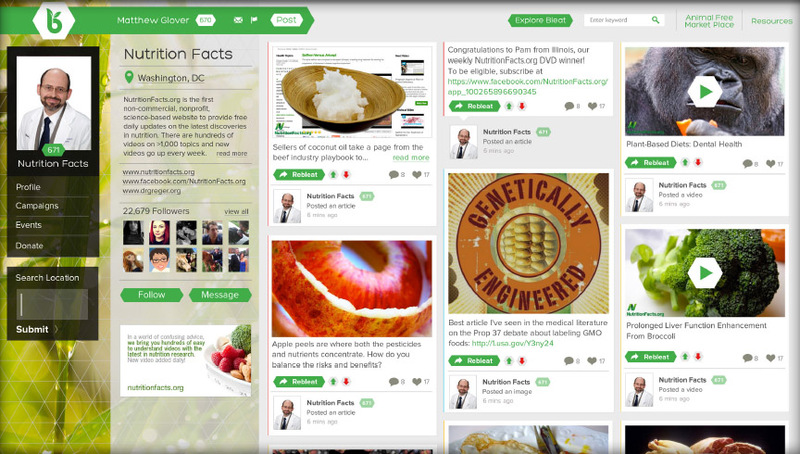 It’ll be a social media platform with advanced search facility to help people find vegan information easily. Who is backing Bleat financially? Will there be advertising? I have funded all of the development work so far, and will continue to do so until it stands on its own two feet. We will be including discreet advertising and sponsored listings for vegan businesses wishing to promote their products. This revenue will then fund the continued management and development of the site going forward. How does launching a vegan-based business differ from getting other business models off the ground? Good question. For me, there are two distinct differences in how I’m approaching the launch. Firstly, when setting up and running a normal business, I would have detailed financial projections and a business plan which considers all the risks before I decide whether to invest time and money. In this instance, because the business is more of a passion, I am more relaxed and am just going with a gut feeling about what is right. I believe that people need to transition towards a vegan way of life, and I believe this platform will help people do this. Secondly, the other businesses I run are fully commercial entities with the ultimate goal of making a profit. With Bleat, Mike and I have agreed that the majority of any net profit will be reinvested in the animal rights movement and vegan outreach activities. We will have overheads which need covering, and we intend to scale up the development of the website and potentially move into other areas, but the bulk of any net profit will be put to good use. It’s starting in the UK and the US, right? When will Bleat be a truly global experience for users? Our intention is for Bleat to be a global site from the outset, encouraging users from all over the world to get involved. That being said, we see the US as the most influential country and with the most advanced vegan community, so we will be keen to get US vegans on board. With Mike and myself from the UK, then this country will also be a priority. I do see the US and UK combined as drivers of social justice movements historically, and the same needs to happen with veganism.